More Than Pet Insurance offer the full range of cat and dog insurance products, starting with Accident Only and going up to Lifetime policies. Vet fees limits range from £1,500 for their Basic Time Limited policy, up to £12,000 for their Premier Lifetime policy. They are one of only a few pet insurance providers who offer the full range of policy types. They are also one of the largest pet insurance providers in the UK, and are owned by RSA Insurance Group. RSA is the second largest general insurance company in the UK. One benefit of More Than being owned by RSA is that they won’t suddenly switch your policy to another underwriter, with different terms. Owned by a leading insurance provider. Large choice of policies with a range of cover options. Access to a 24/7 Vet helpline. Excess for older pets is quite high. You don’t have much time to notify them of a claim. Additional excess if you don’t use a vet in their referral network for referral treatment. 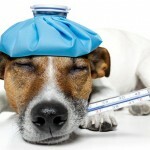 Click here to see our summary page with details of all More Than Pet Insurance policies. More Than offer 4 different policy types, and most of these have a couple of vet fees limit options making a total of 7 options. All policies include cover for accidental damage (both cats and dogs), and third party liability (dogs only). As you move up their range of policies, you get more features included as standard or available as an optional extra. Claim limits also tend to increase with the more comprehensive policies. As the name suggests, this is an accident only policy, which means your pet is only covered if they are injured in an accident. Treatment for any illness not related to an accident is not covered. In addition, cruciate ligament problems are not covered either, regardless of cause. This is More Than’s cheapest policy, however cover is rather limited compared to their other options. The policy covers vet fees up to £2,500 for each accident, with a maximum treatment period of 12 months. This means that should your pet need long-term treatment after an accident, the cover will stop after 12 months. It’s also important to note that the limit is per accident, not injury. This means if your pet were to suffer multiple injuries in the same accident, they would all be covered by the same limit. This also means that if you haven’t yet hit the 12 month or vet fees limit, you would need to renew your policy if your pet is still undergoing treatment for their injuries when the policy ends. In addition to accident cover, you also get £500,000 of third party liability cover for dogs, and accidental damage cover for £500. Lost and Found cover – they will pay £1,000 each for advertising locally and offering a reward if your pet is lost or stolen. In the unfortunate event your pet isn’t found, they will also pay the purchase or donation price up to £1,000. Farewell Cover – If your pet needs to be put to sleep by a vet, this policy will cover the cost of euthanasia, cremation and burial up to £150. Visit our policy page to find out more details about More Than Accident Only Pet Insurance. The Basic policy is a Time Limited product with your choice of two vet fees limits – either £1,500 or £3,000. The policy also provides £500 of accidental damage cover, for damage caused by your pet to personal property at someone else’s property. This policy will also cover the purchase/donation price of your pet (up to £500) if it dies from illness or an accident. As this is a Time Limited policy, it will only pay out for a period of 12 months for a specific condition, or until the fees limit is reached. If your pet suffers the same condition again after 12 months has passed since the first occurrence, it won’t be covered even if you renew the policy. Pets Abroad Cover – This is needed to cover the payment of European vet fees claimed outside of the UK, plus holiday cancellation and quarantine costs. Visit our policy page to find out more details about More Than Basic Pet Insurance. The Classic policy is a Maximum Benefit policy, with either £4,000 or £8,000 of vet fees cover for each accident or illness. As long as you keep renewing the policy, there are no time limits – you can make repeated claims for a condition over a period of years, until you reach the claim limit. This policy also includes a couple of features as standard that are optional in the cheaper Basic policy. Lost & Found, as well as Pets Abroad Cover are both included as standard. Visit our policy page to find out more details about More Than Classic Pet Insurance. This is the most expensive, and comprehensive policy from More Than. It is a Lifetime policy, and offers either £4,000 or £12,000 of cover per year. One thing to note is that this limit is a total, and there is another limit of £1,000 and £4,000 respectively per condition. This means that if you have the policy with the £12,000 limit it would pay out up to £4,000 each for 3 different conditions, but would not cover a claim for a single condition of more than £4,000. As this is a Lifetime policy, these limits are reset every year. With this in mind, the £4,000 per condition limit with the £12,000 policy should be sufficient for most people but you may want to bear this in mind when making your decision. The Premier policy also includes all the cover that is an optional extra with the other policies, so Lost & Found, Pets Abroad and Farewell cover all come as standard. The other claim limits with this policy are higher than with Basic and Classic policies. For example you can claim up to £2,000 for Accidental Damage, and the same amount for death by accident or illness. In addition, the Premier policy also includes dental cover which the 3 other policies do not include. This is on condition that your pet had a dental examination in the 12 months prior to the condition, and you followed your vet’s advice. Visit our policy page to find out more details about More Than Premier Pet Insurance. We have compared More Than quotes to the average taken from a number of other quotes, and in general they compare well. You can read more about how these value scores were calculated by reading our blog article on Best Value Pet Insurance for Cats & Dogs. 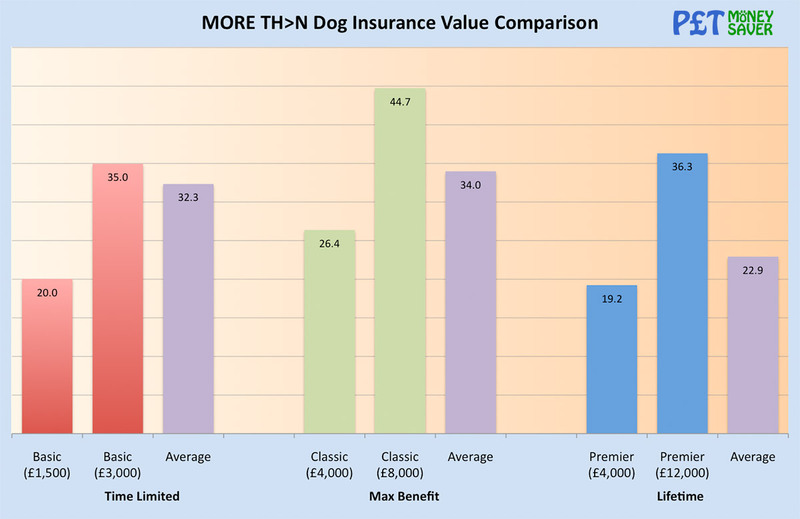 Looking at their dog insurance policies first, the chart below shows the value rating that we calculated for the Basic, Classic and Premier policies. In each case, the policy with the higher vet fees limit gets an above average value score. A higher score means you pay less than average for every £ of vet fees cover. 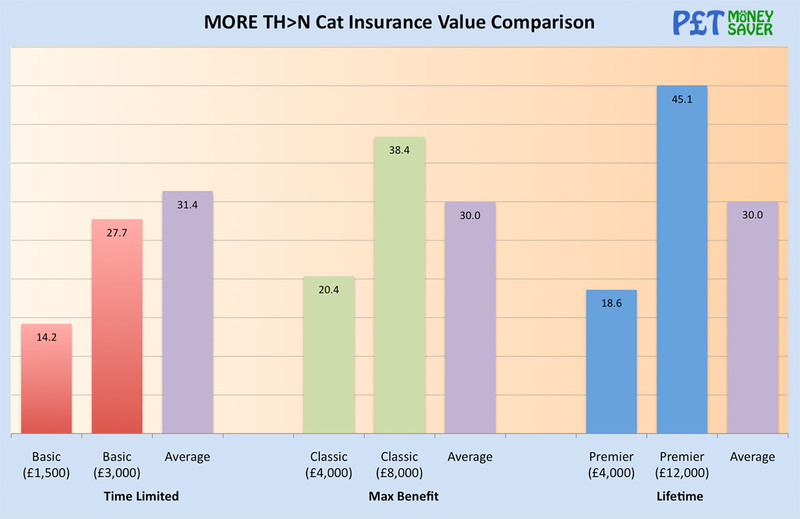 Looking at the value ratings that we calculated for More Than cat insurance policies, the story is the same for the Classic and Premier policies. The Basic policies however rate slightly lower than average. More Than charge a standard fixed excess for each illness or accident of £100 for both cats and dogs. If your pet is under 9 years old, you can also choose to pay an additional voluntary excess of either 10% or 20% of the bill. If you opt to pay a voluntary excess your premiums will be lower, however this may not be the best value if you have to make a claim. Once your pet reaches 9 years of age, you will have to pay a compulsory excess of 20% for each bill for treatment – this replaces any voluntary excess you may have selected. The voluntary or compulsory excess work in the same way, and are paid on each bill. For example, if your dog had an accident and hurt it’s leg you may have a claim for £1,000 in total, comprising two visits to the vet. You would pay the fixed excess of £100 for the first bill, plus 20% of the remaining £500 (£100), making a total of £200. As the second bill for treatment is related to the original condition, you wouldn’t need to pay the fixed £100 again, however would still pay the voluntary 20% – a total of £80. As you can see, your excess charge could be quite considerable if your pet needed expensive treatment, and may be more than you save with the lower premiums. The table below shows the yearly premiums we were quoted, and also what excess would be payable for a range of claims. As you can see, the premiums are lower if you opt for paying a voluntary excess, which is great if you never need to make a claim. However if you made a claim for £500 during the year, you would pay £40 more with the 10% excess option, and £80 more if you went for the 20% excess option. In both case, this amount is less than you would save on the premiums so you would be better off. However, if you claimed for £1,000 of treatment during the year you would pay an extra £90 for the 10% excess policy, and an extra £180 for the 20% excess policy. In both cases, this is more than you would save on the lower premiums. Therefore, you need to choose whether you want to pay lower monthly/annual premiums and hope that you don’t have to make a large claim. Or accept you pay a higher monthly fee, but can be certain you won’t be hit with any unexpected excess charges should you make a claim. Your figures are likely to be different as cat and dog insurance quotes depend on many factors, so it’s definitely worth comparing the costs and making your own choice based on your figures. More Than will also charge an additional £200 if a referral vet from outside their preferred referral network is chosen for non-emergency treatment. This would be when your usual vet advises you that you need to go to another vet for certain treatment or surgery. When you take out a pet insurance policy with More Than, you also get access to their Vetfone veterinary advice helpline. This is a 24/7 helpline where you can call up and speak to a qualified RCVS veterinary nurse who will discuss any health problems your pet may have with you, plus provide advice before you visit your vet. If your call is at the weekend or late at night, they can direct you to the nearest out of hours veterinary clinic for emergency assistance, offering you peace of mind if the unexpected happens. Unlike some providers, there is no upper age limit for new policies so More Than will allow you to take out a new policy for older pets. You should expect premiums to be higher though the older your cat or dog is. You can find out more about why this is in our blog articles How Much is Cat Insurance? and How Much is Dog Insurance? There are some changes to cover though when your pet reaches 9 years old. Firstly the excess changes goes from a fixed £100 to the fixed £100 plus a compulsory 20% of any bill. Secondly, death from illness claims are no longer covered. However, if your policy includes death from accident cover, this is still valid. If you take out a policy online, you get 25% introductory discount on your first year’s premium. This is great for the first year, but you should consider how much the premiums will be if you renew and no longer receive the introductory discount. If you insure more than one pet on the same policy, you’ll get a 10% multi-pet discount for each additional pet you add, up to three pets. As standard with virtually all other providers, More Than do not cover pets younger than 8 weeks of age. More Than policies do not cover any accidents within the first 48 hours of your cover start date of your first policy. They also do not cover any illness that occur within the first 14 days of the start of your first policy. 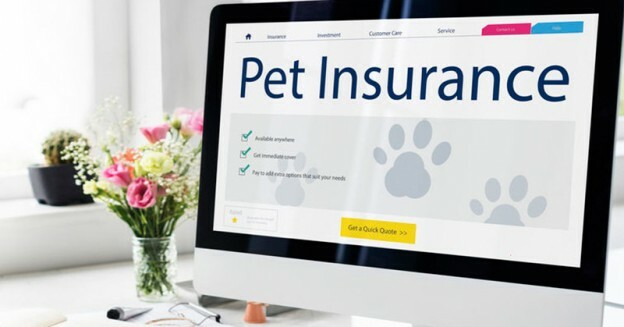 As is common with virtually all pet insurance providers, their policies do not cover pre-existing conditions, that you are aware of when taking out the policy. The Accident Only policy does not cover any treatment for cruciate ligament problems however caused. Dental cover is not included in the Accident Only, Basic and Classic policies – it’s only available with the Lifetime Premier policy. You need to notify More Than within 60 days of a injury or illness occurring, and within 31 days of your vet telling you that treatment is needed. They will also not pay claims for any vet bills that are more than 12 months old. You can download a pet claim form from their website, or call them on the phone. If your pet needs regular ongoing treatment, you are able to send invoices and receipts every 3-6 months. More Than can also pay most vets directly, which saves you having to pay the vet yourself then claim the money back. More Than have 5 policies that are 5 star defaqto rated in 2018. These scores are valid for both their cat insurance and dog insurance products. As More Than offer such a wide range of policies, it’s difficult to compare each one to other providers. However we’ve selected a couple of policies and suggested alternatives you might want to review to see how they compare. 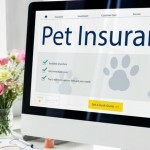 Choosing the best pet insurance policy for your cat or dog depends on your own unique requirements. You can find out more about pet insurance in general by reading our Guide to Pet Insurance. You can also see what factors influence the costs of cat insurance and dog insurance. 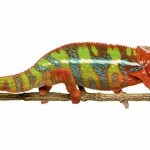 Finally you can compare the key details of pet insurance policies using out Pet Insurance Comparison page. It’s important to point out that this article is for information only, and is intended to help you make your own decision. We do not recommend any policy or provider, and suggest you do your own research before taking out a policy. How Much is Dog Insurance? This entry was posted in Cat, Dog, Pet Insurance on January 16, 2019 by Ed. How Much is Cat Insurance?